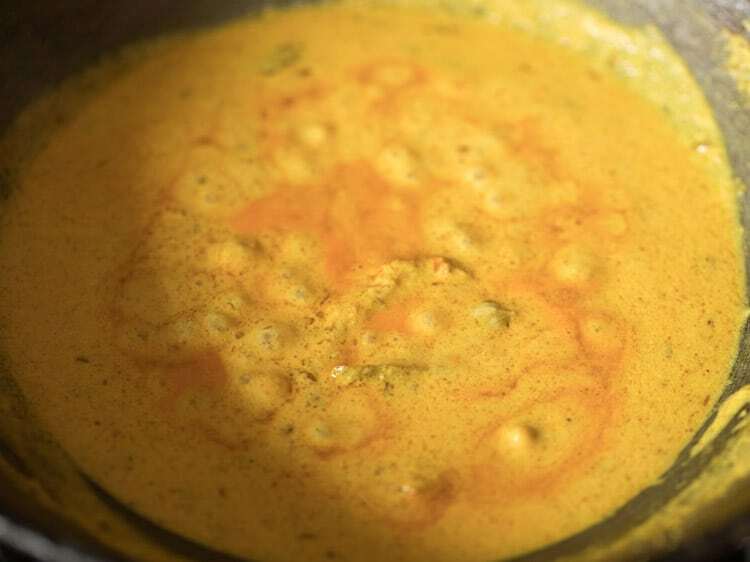 gatte ki sabji is a popular gravy based dish from the rajasthani cuisine. gatte are gram flour (besan) roundels which are added to a curd based gravy. gatte ki sabji recipe with step by step pics. 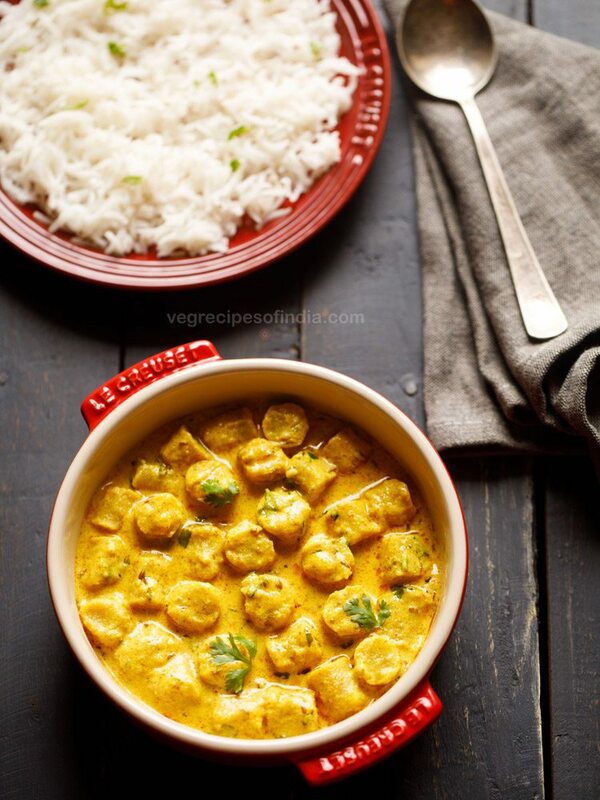 gatte ki sabji is a popular gravy based dish from the rajasthani cuisine. 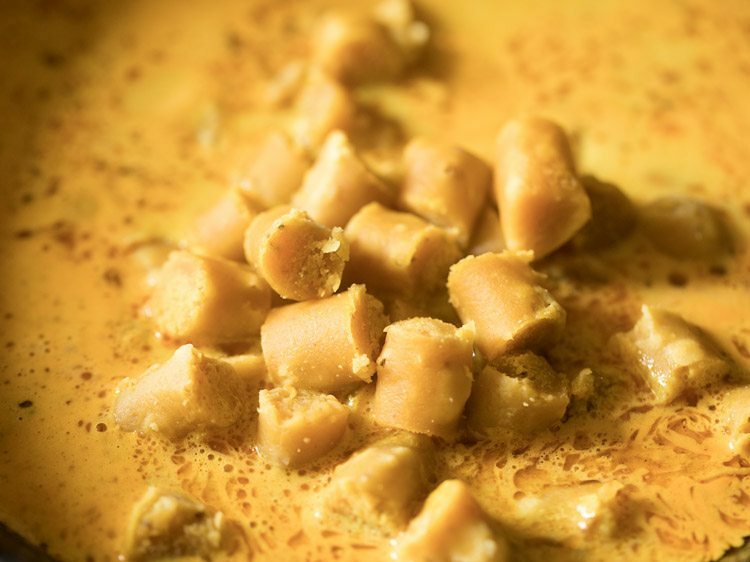 gatta or gatte (plural) are gram flour (besan) roundels which are added to a curd based gravy. 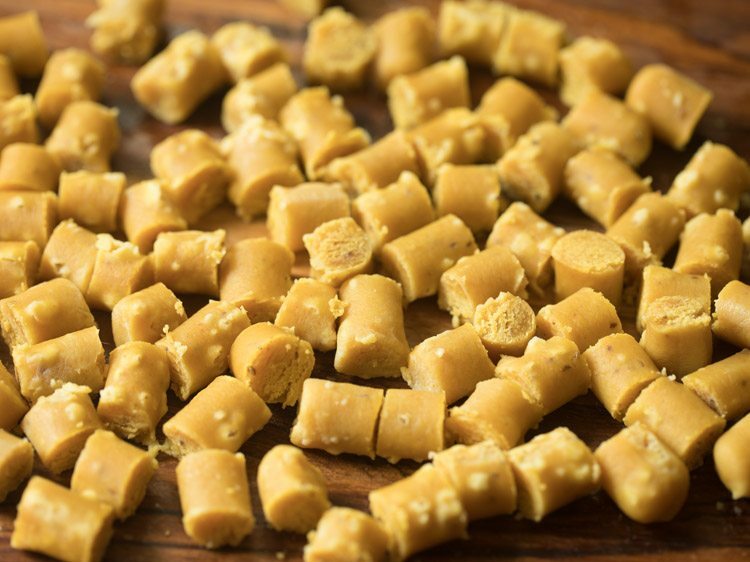 there are many variations of making rajasthani gatte ki sabzi. at home we make a punjabi version of gatte ki sabzji with an onion-tomato gravy where curd is not added. in the rajasthani version of the recipe, as i have mentioned before curd is added. 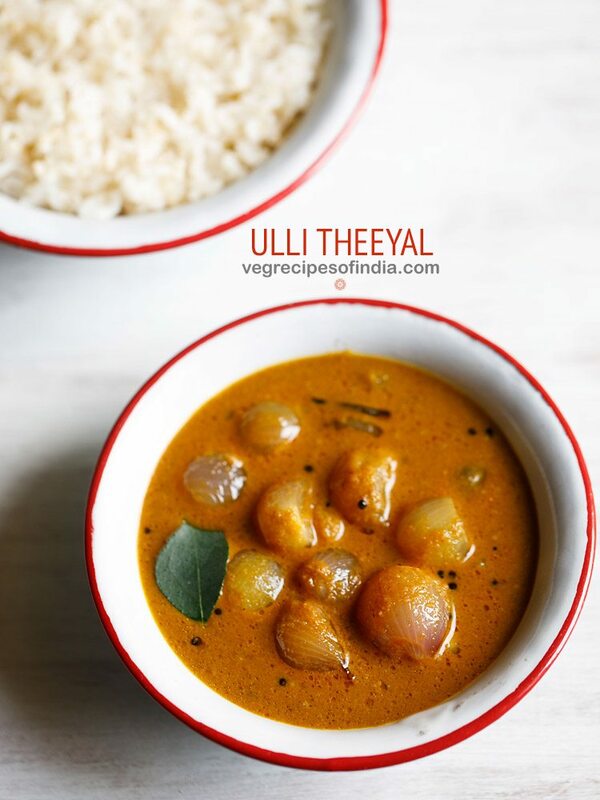 apart from curd, in some variations, onion and tomatoes are also added. 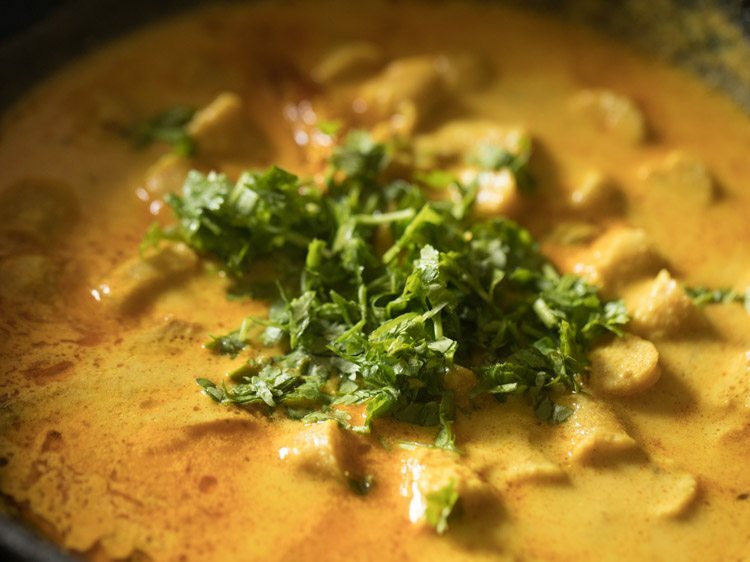 in this gatte ki sabji recipe, i have only added onions with some garlic and ginger. i wanted a really good taste in the sabzi, so added both onion and garlic. in fact onions and garlic can also be skipped. 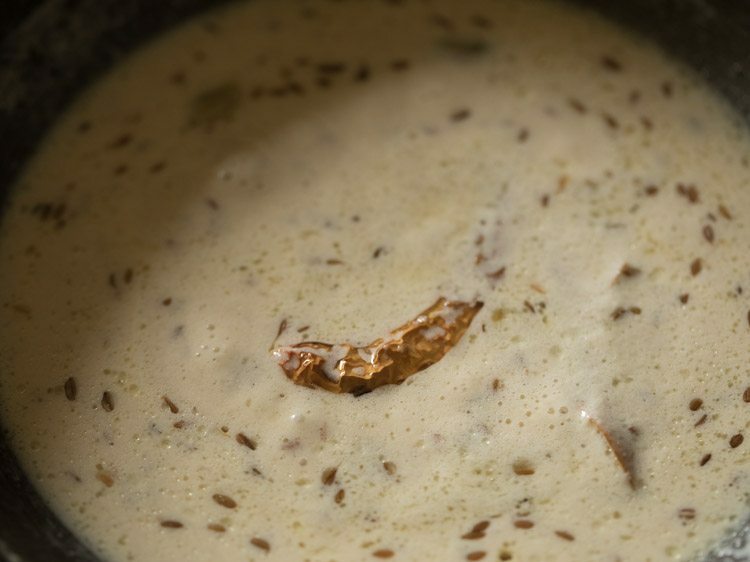 in the absence of onions and garlic, the end result would be a gatte ki kadhi, where the gravy or sauce would be like a kadhi. i have been getting a lot of requests for rajasthani gatte ki sabji. making the gatte is not difficult. 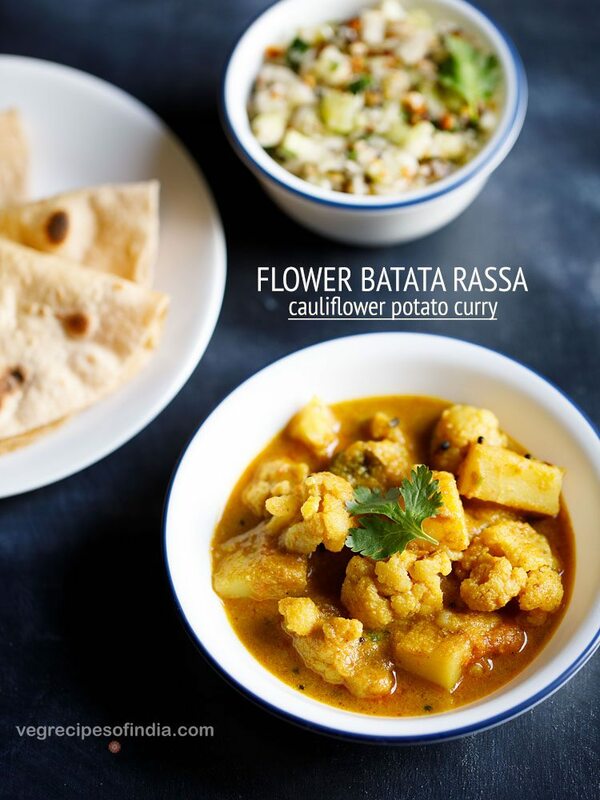 with this recipe, you can get soft gatte which do not become hard or dense after cooking. making gatte ki sabzi does take some time. 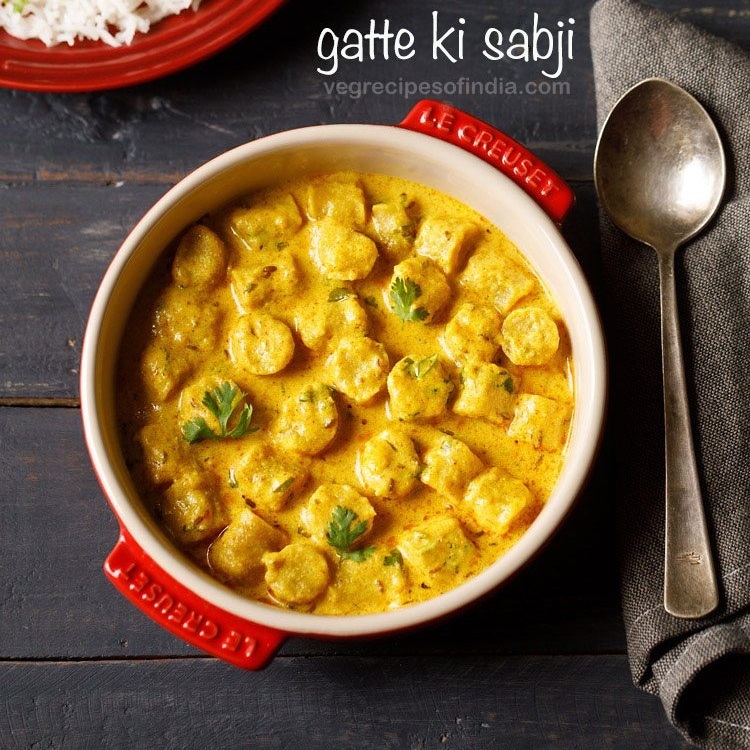 what you get after some effort and time is a really delicious and spicy gatte ki sabzi, which can be relished with some rotis or steamed rice. in a large bowl or a plate, take 2 cups besan (200 grams). 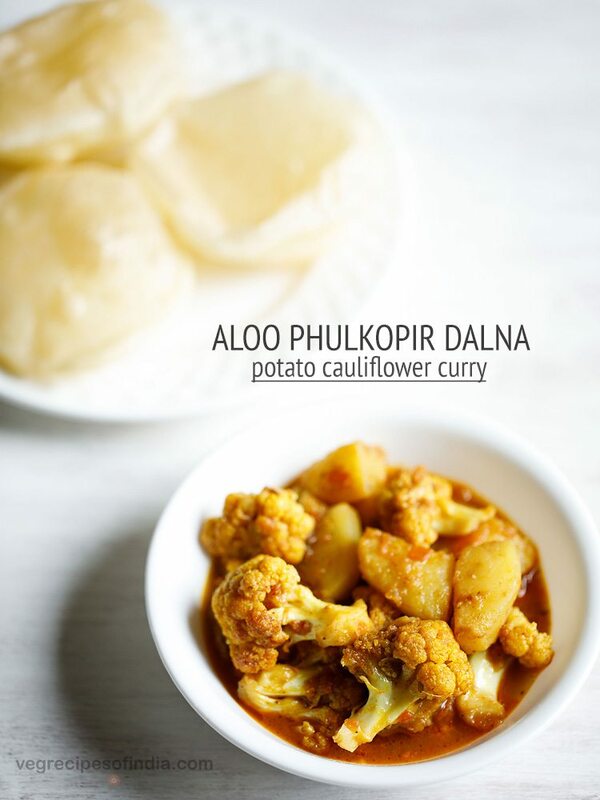 add the following ingredients – 1 pinch asafoetida, ¼ teaspoon turmeric powder, ½ teaspoon carom seeds (ajwain), ½ teaspoon red chili powder and 1 teaspoon coriander powder. also add 1 teaspoon salt or add as per taste. add 3 tablespoons oil and 2 tablespoons curd. mix everything very well. making sure that the oil is mixed evenly. then add water in parts and begin to knead. knead very well allowing the besan to absorb water. overall knead for 10 to 11 minutes. you will need 4 to 5 tablespoons water. addition of water will depend on the type of flour. 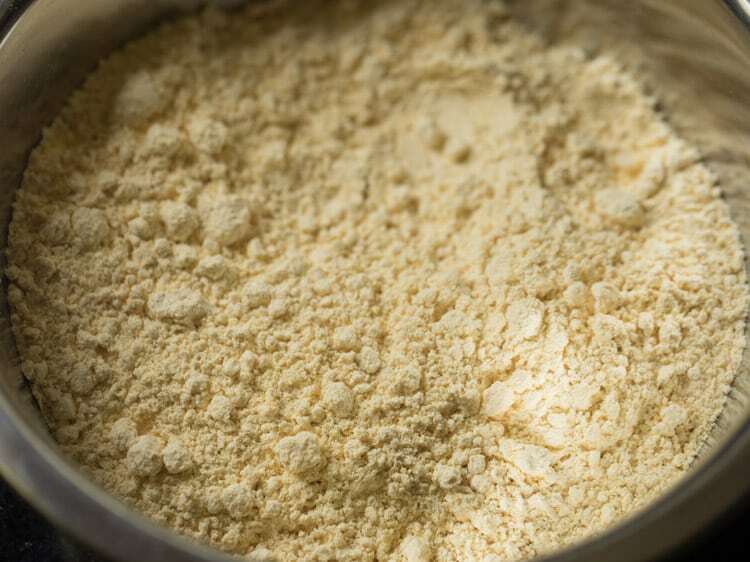 also if the curd used is watery or has more whey in it, less water will be required. knead to a semi soft dough like a poori dough. it should be easy to roll and shape without applying too much of force or strength. you should not see cracks on the dough. if there are cracks, then sprinkle water and continue to knead. in case the dough becomes sticky, then sprinkle some besan and knead again. 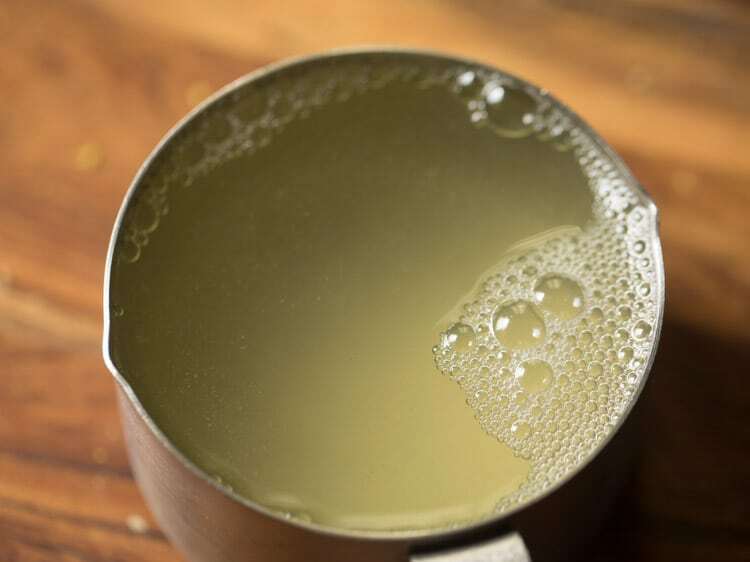 before making the gatte, take 4 cups water in a pan or kadai. heat the water on medium or medium-high flame. 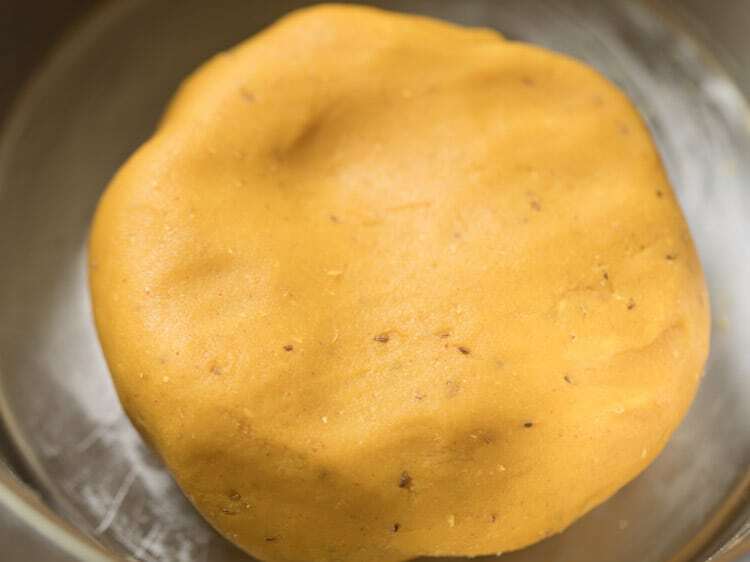 divide the besan dough in 6 equal parts. roll each part to a smooth ball. 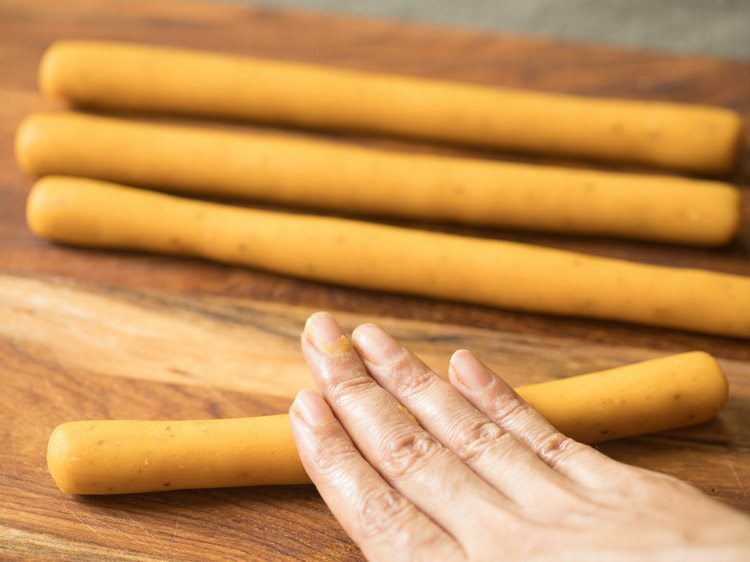 now with your fingers, roll each dough ball to a soup stick like cylindrical shape. do this with all the 6 dough pieces. 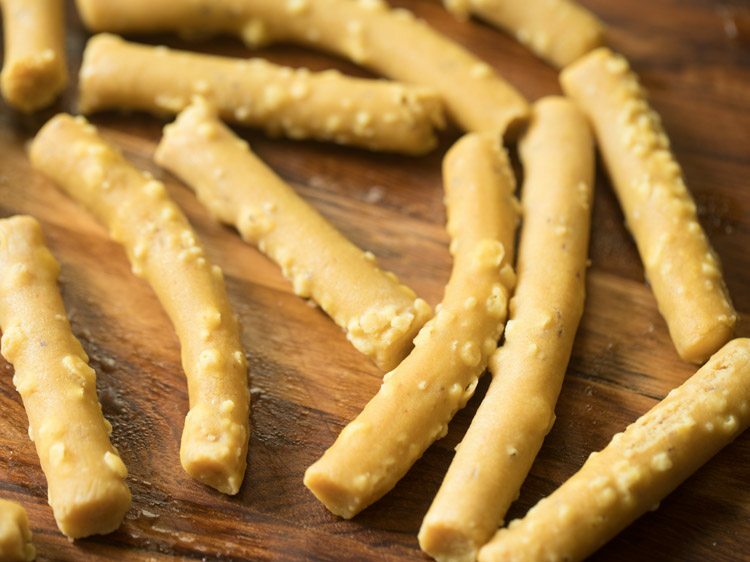 slice each dough piece in two to three parts so that they can be placed easily in the kadai. increase the flame to a high or medium-high and let the water come to a boil. now gently place each gatte in the hot boiling water. do not over crowd the pan. so its better to use a medium to large kadai. 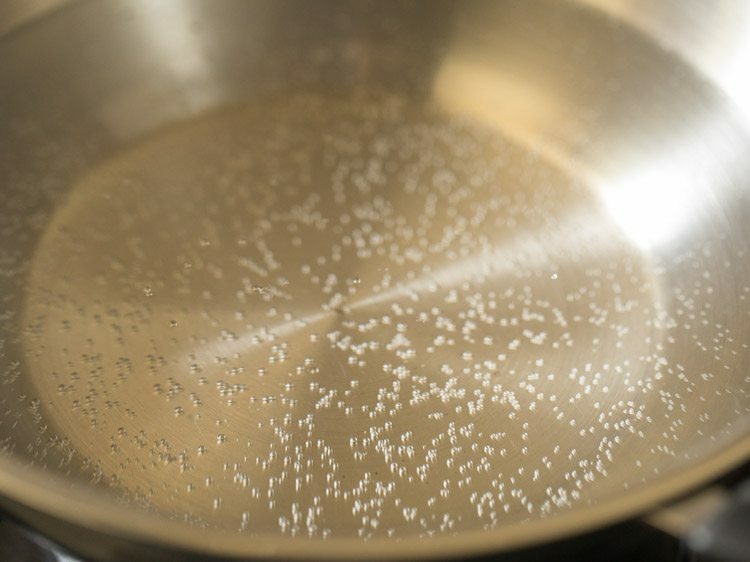 after they are cooked, the gatte pieces should float on top and bubbles will be seen on them. this means that they are cooked. 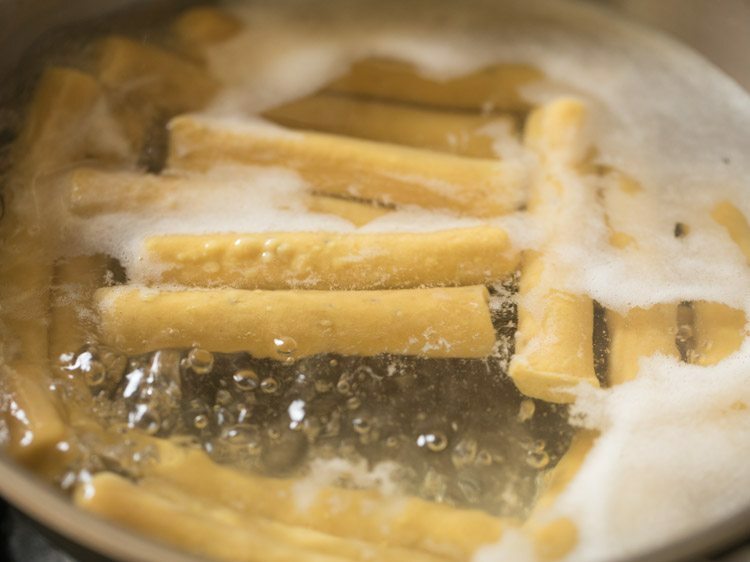 gently remove them with a slotted spoon draining the extra water. 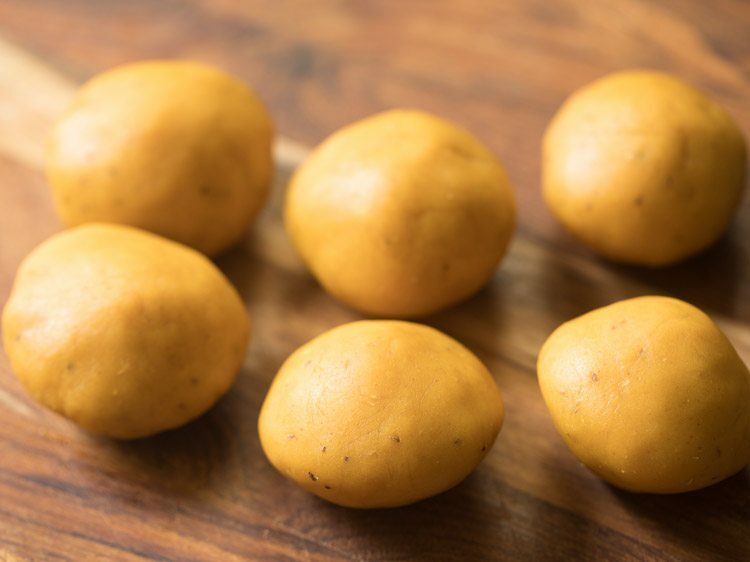 place them on a board or plate and let them become warm or cool at room temperature. 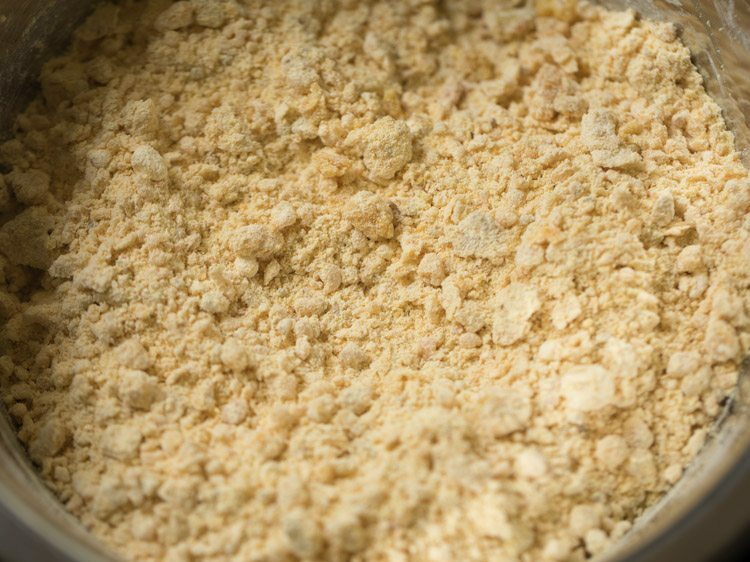 in a small grinder or blender jar, take ½ cup roughly chopped onion. also add ½ teaspoon chopped garlic and ½ teaspoon chopped ginger. 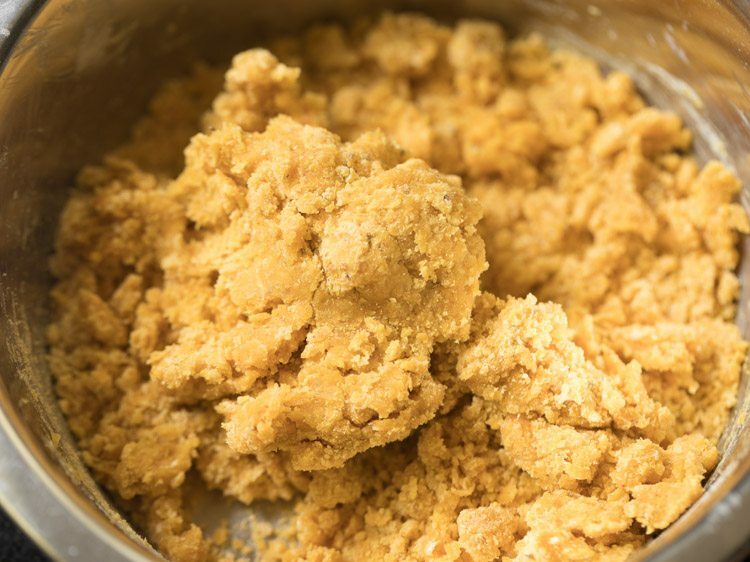 add 1 to 2 tablespoons water or add as required and grind to a fine paste. keep aside. meanwhile whisk 1 cup of curd (240 to 250 grams) till smooth. keep aside. reserve 1 cup of the water in which the gatte were cooked. keep aside. cut the cooked gatte in small round thick discs. heat 2 tablespoons oil or ghee in another pan. keep flame to a low or medium-low. add 1 teaspoon cumin seeds, 3 cloves, 1 inch cinnamon, 2 green cardamoms, 1 small to medium tej patta and 1 dry red chilli (seeds removed). add all the spices together. so keep them ready before you heat the oil. fry till all the spices crackle. do not burn the spices, so fry them on a low flame. now add the onion paste. take care as the onion paste splutters when you add it. mix well. 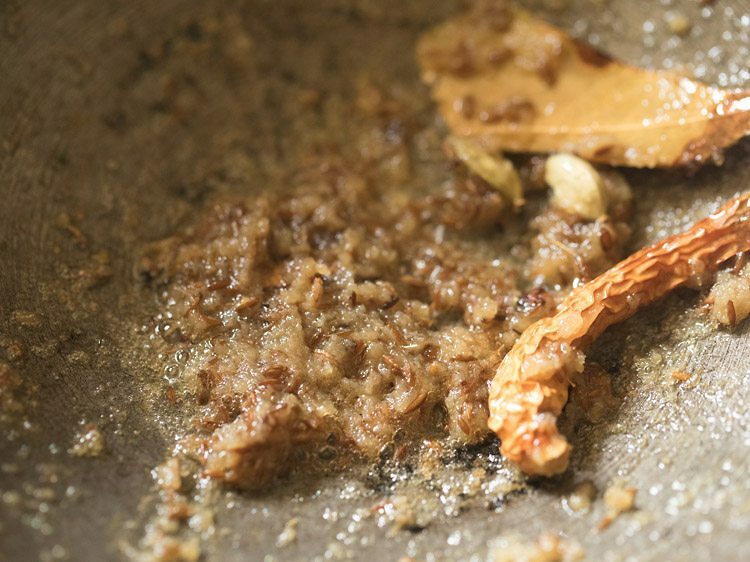 stirring often sauté onion paste on a low to medium-low flame till it turns golden. now switch off the flame and add the whisked curd. you can also add the beaten curd in parts. quickly mix the curd very well with the sautéed onion paste. 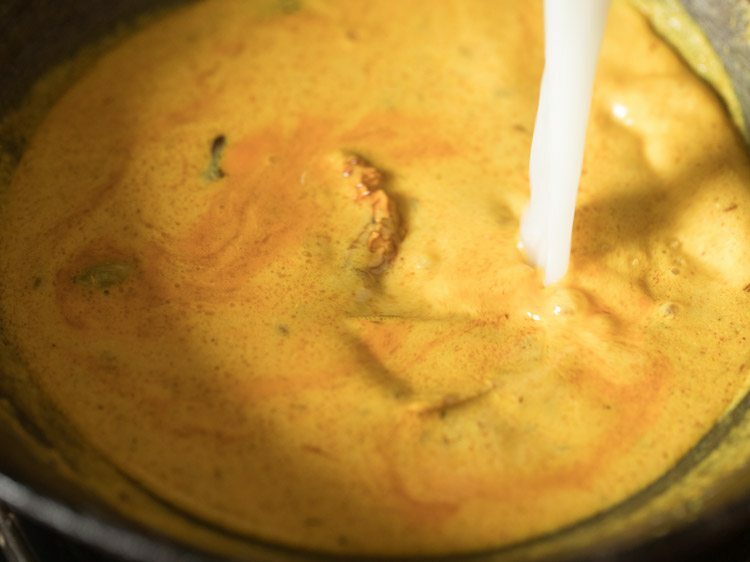 now heat the pan on a low flame and keep on stirring continuously while the curd gets cooked. let the curd come to a boil and you will see some oil specks on top. 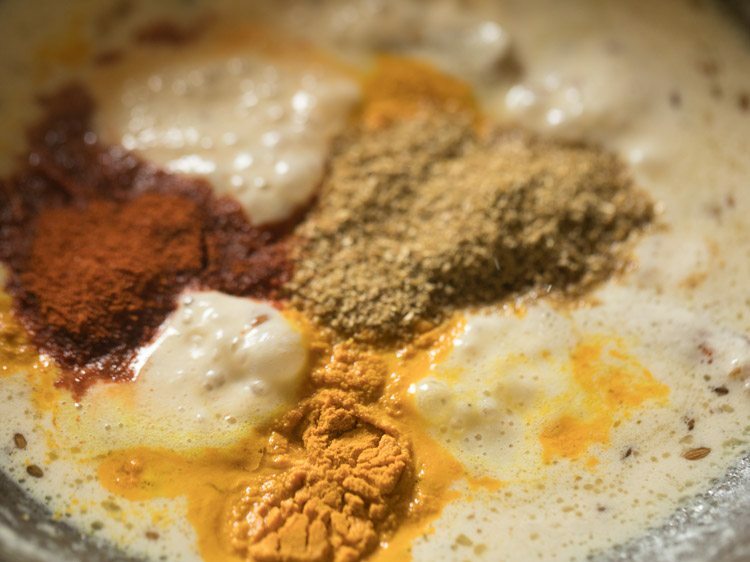 then add all the spice powders one by one – ½ teaspoon turmeric powder, 2 teaspoons red chilli powder, 1 tablespoon coriander powder and 1 pinch asafoetida (optional). 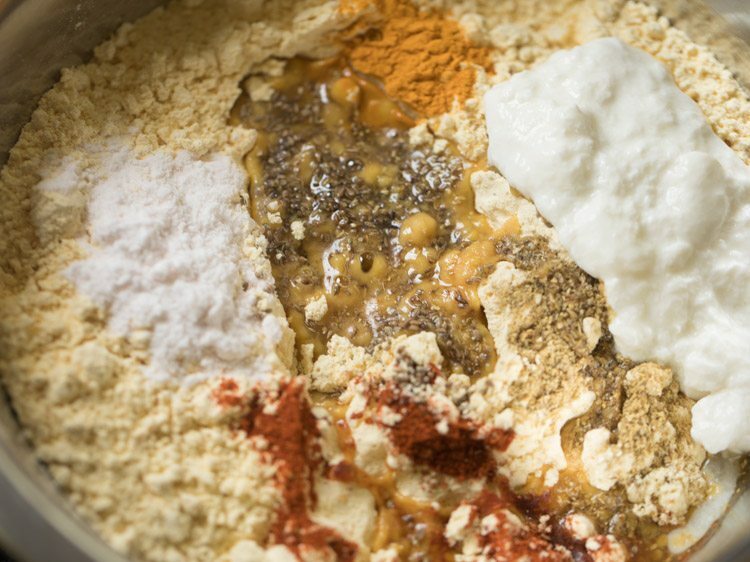 mix the spice powders very well with the curd. 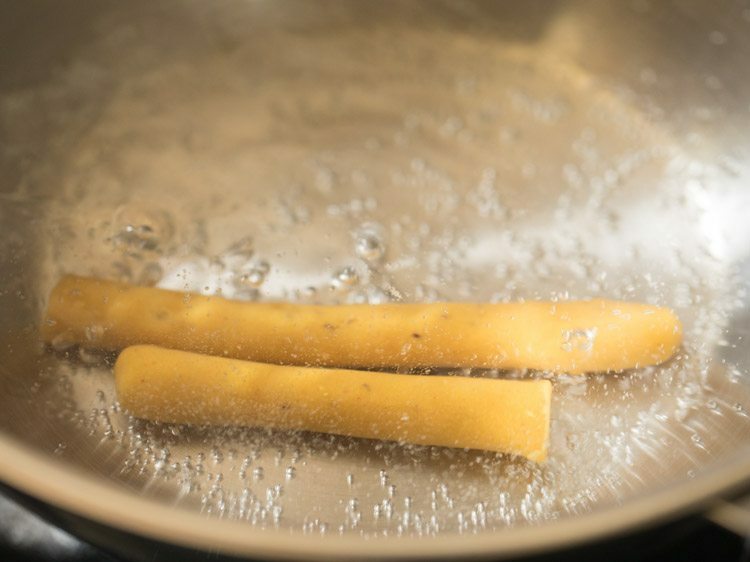 continue to sauté for 1 to 2 minutes till you see some oil floating on top. now add 1 cup of reserved water in which the gatte were cooked. mix very well. add salt as per taste. mix again. 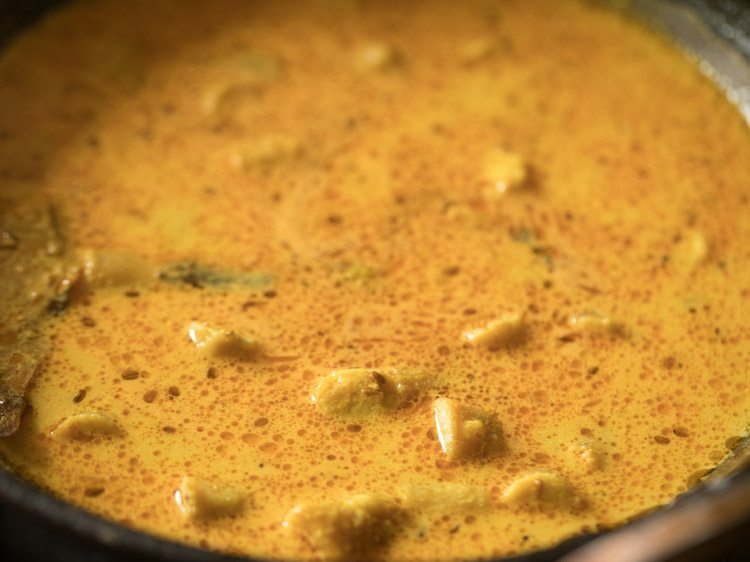 simmer the gravy or curry on a medium-low flame. stir at intervals. let this gravy to a boil. once the gravy comes to a boil, then add all of the gatte pieces. stir gently and lightly. simmer on low to medium-low flame till curry thickens slightly. 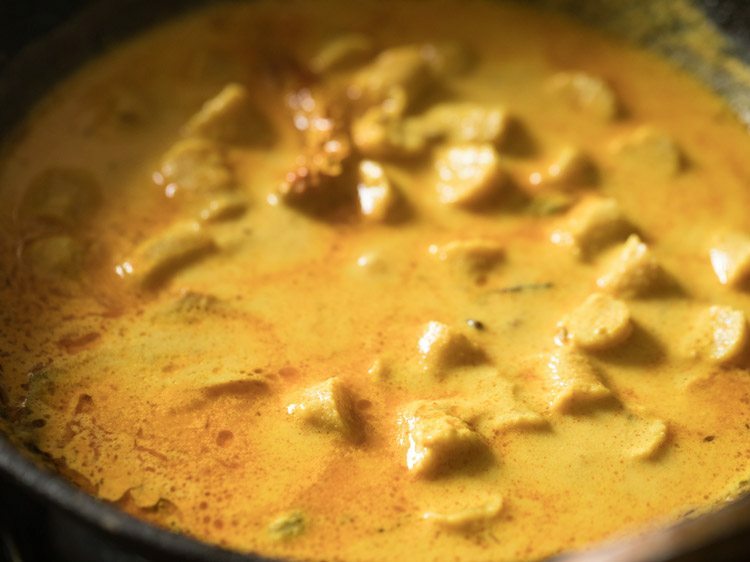 overall cook the gatte ki sabji for about 5 to 6 minutes or till the gravy thickens slightly. do note that on cooling the gravy thickens more. later switch off the flame and add 2 tablespoons chopped coriander leaves. 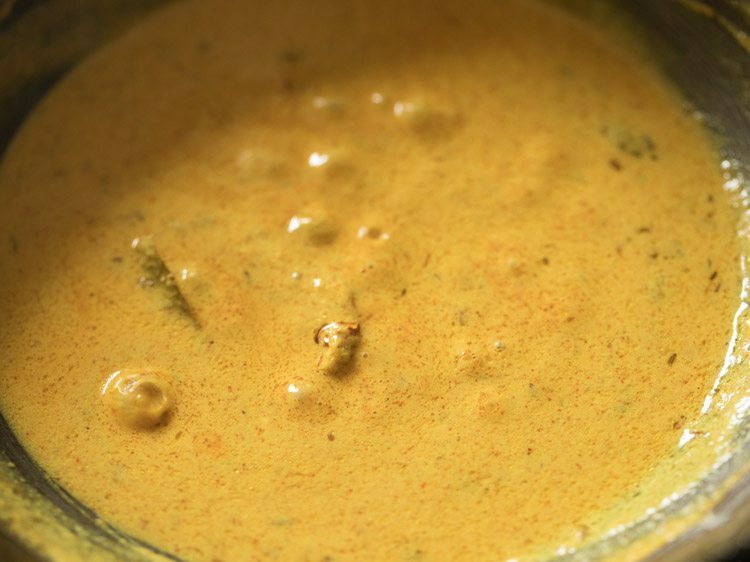 serve gatte ki sabji with roti or parathas or jowar roti or bajra roti. 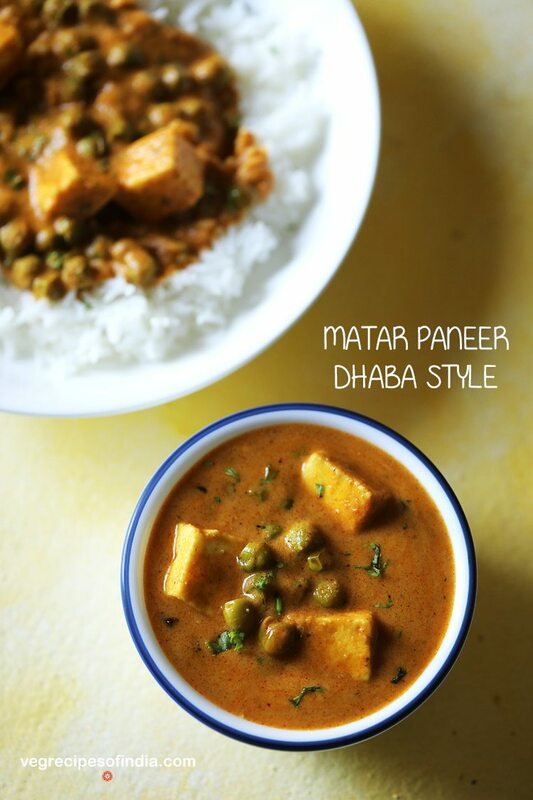 you can also serve this besan ki sabji with steamed rice or jeera rice. please use full fat curd. homemade curd is the best. do not use curd made from low fat milk or toned milk. both onion and garlic can be skipped in the recipe. add water as required depending on the consistency of the gravy you want. 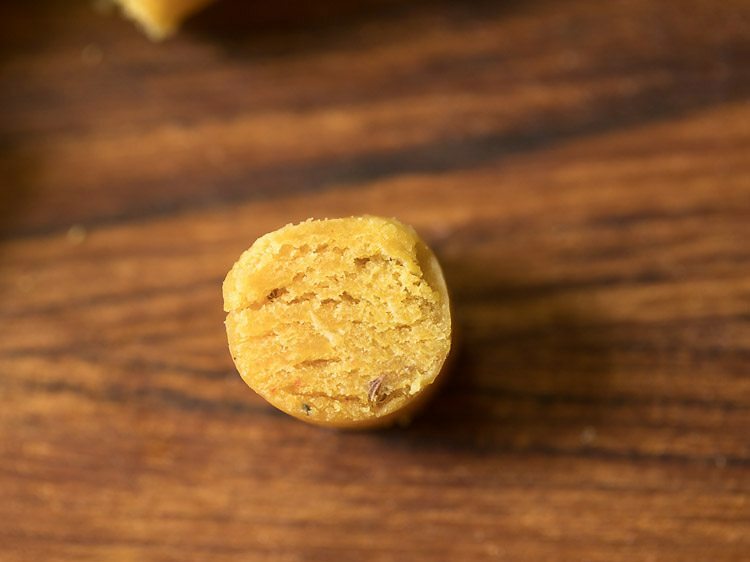 2 teaspoons of red chilly powder makes the gatte ki sabzi spicy. for less spicy taste, add ½ to 1 teaspoon red chilly powder. in this case also reduce the amount of coriander powder to ½ tablespoon. 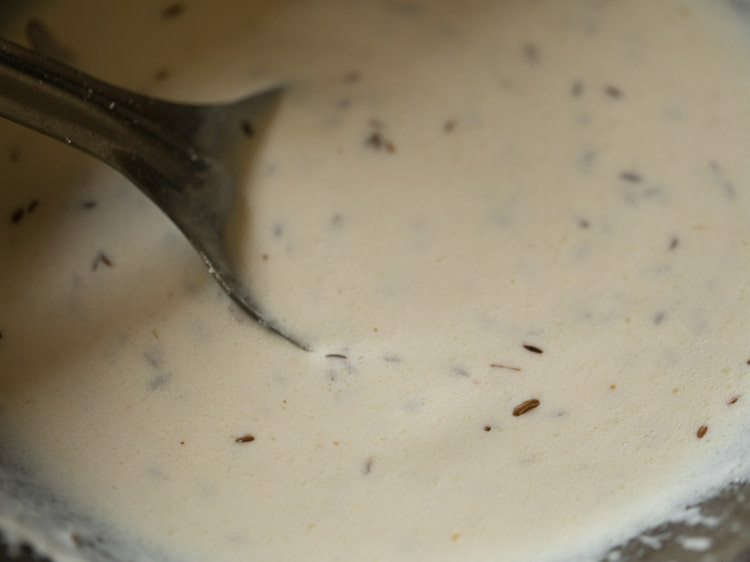 gatte can be made a day before also and then added to the gravy. keep the gatte in fridge if making a day before. 1. in a large bowl or a plate, take 2 cups besan (200 grams). 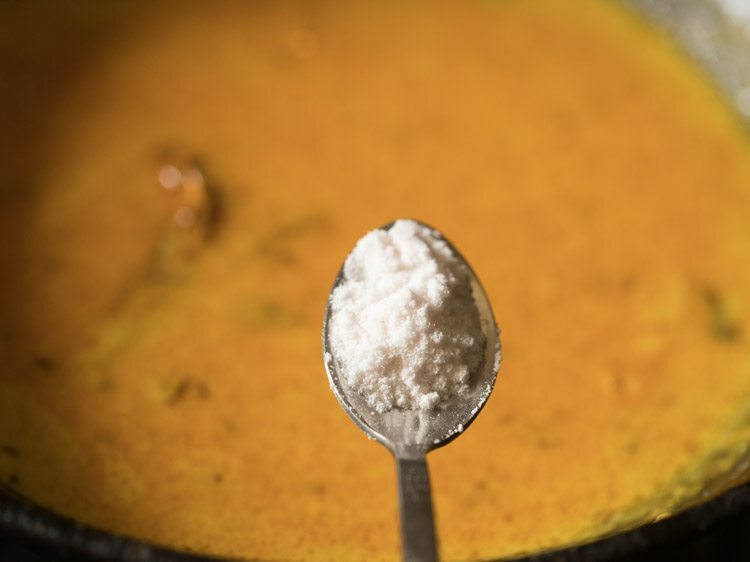 2. add the following ingredients – 1 pinch asafoetida (hing), ¼ teaspoon turmeric powder, ½ teaspoon carom seeds (ajwain), ½ teaspoon red chili powder and 1 teaspoon coriander powder. also add 1 teaspoon salt or add as per taste. 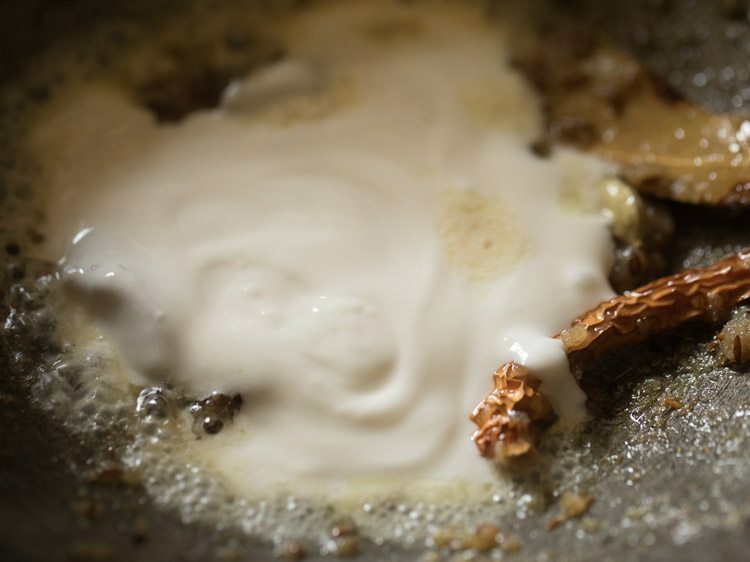 3. add 3 tablespoons oil and 2 tablespoons curd. 4. mix everything very well making sure that the oil is mixed evenly. 5. then add water in parts and begin to knead. knead very well allowing the besan to absorb water. overall knead for 10 to 11 minutes. 6. you will need 4 to 5 tablespoons water. addition of water will depend on the type of flour. 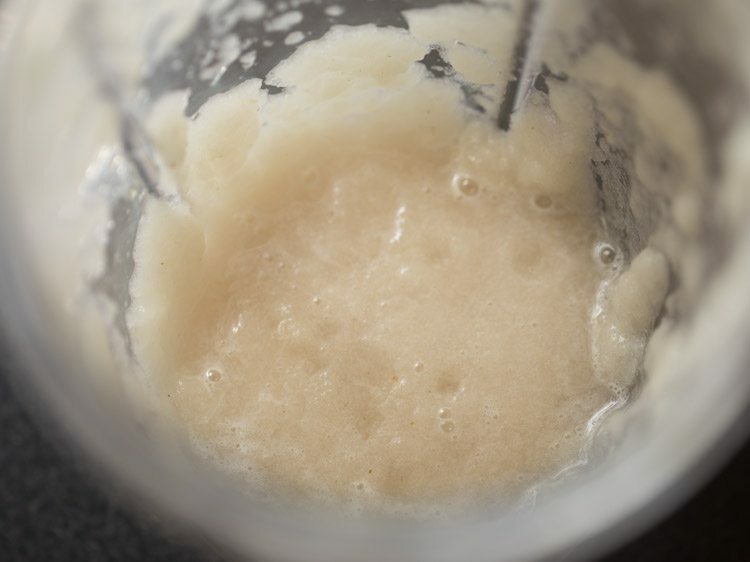 also if the curd used is watery or has more whey in it, less water will be required. 7. knead to a semi soft dough like a poori dough. it should be easy to roll and shape without applying too much of force or strength. you should not see cracks on the dough. if there are cracks, then sprinkle water and continue to knead. in case the dough becomes sticky, then sprinkle some besan and knead again. 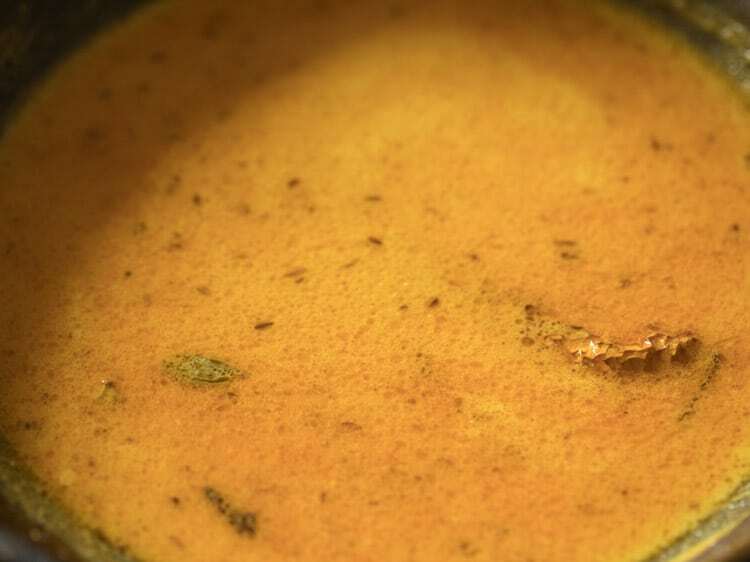 8. before making the gatte, take 4 cups water in a pan or kadai. heat the water on medium or medium-high flame. 9. divide the besan dough in 6 equal parts. roll each part to a smooth ball. 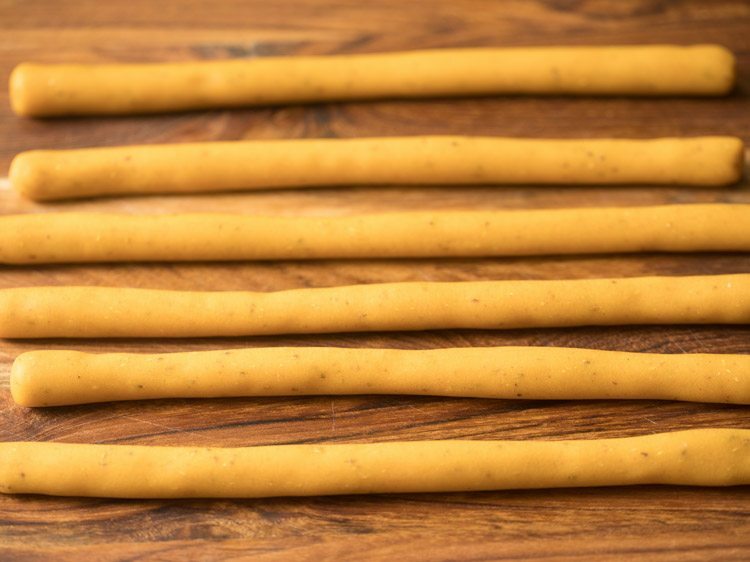 10. now with your fingers, roll each dough ball to a soup stick like cylindrical shape. 11. do this with all the 6 dough pieces. 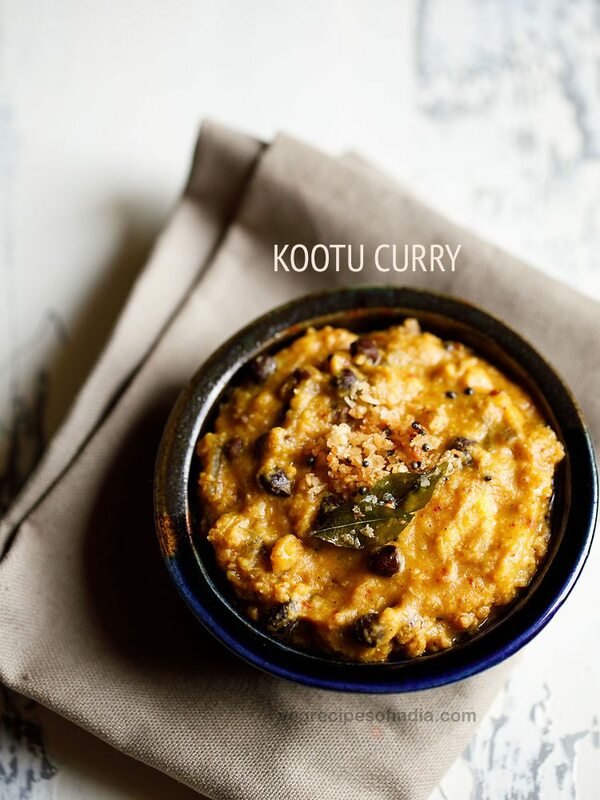 slice each dough piece in two to three parts so that they can be placed easily in the kadai. 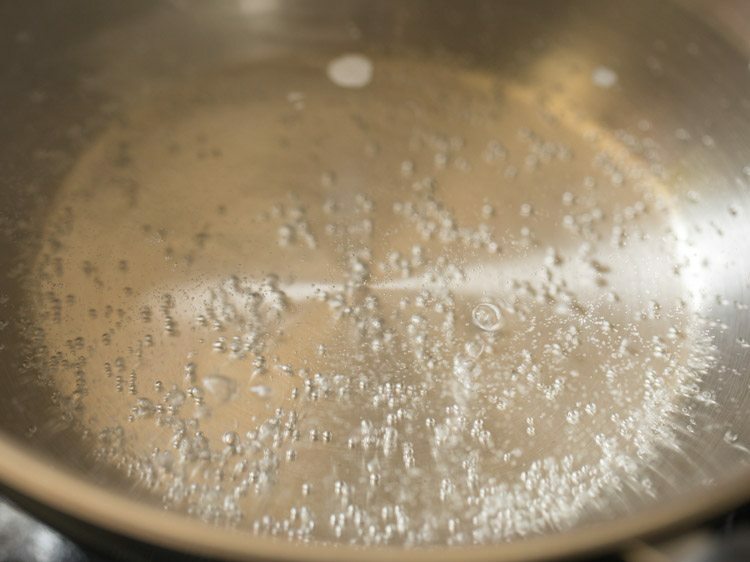 12. increase the flame to a high or medium-high and let the water come to a boil. 13. now gently place each gatte in the hot boiling water. 14. do not over crowd the pan. so its better to use a medium to large kadai. 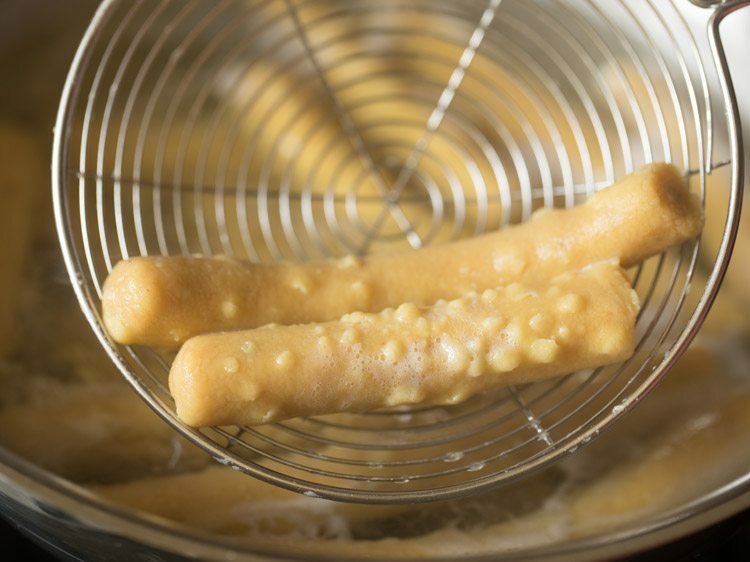 15. after they are cooked, the gatte pieces will float on top and bubbles will be seen on them. this means that they are cooked. 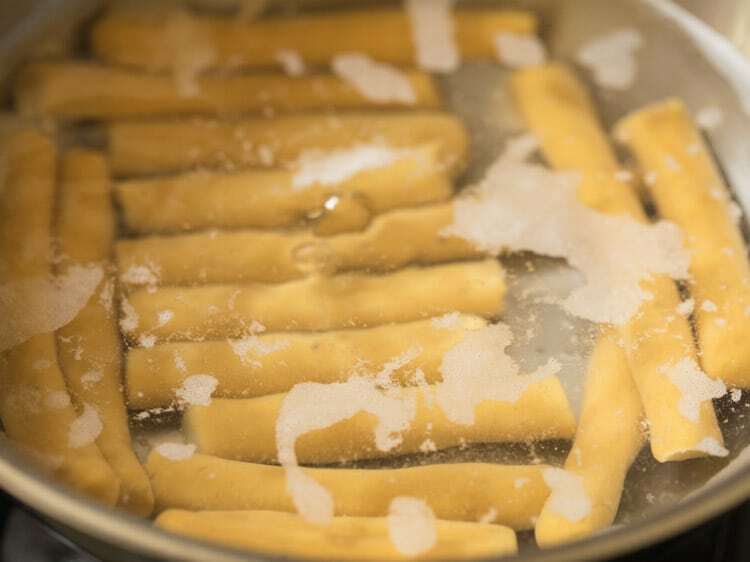 16. gently remove them with a slotted spoon draining the extra water. 17. place them on a board or plate and let them become warm or cool at room temperature. 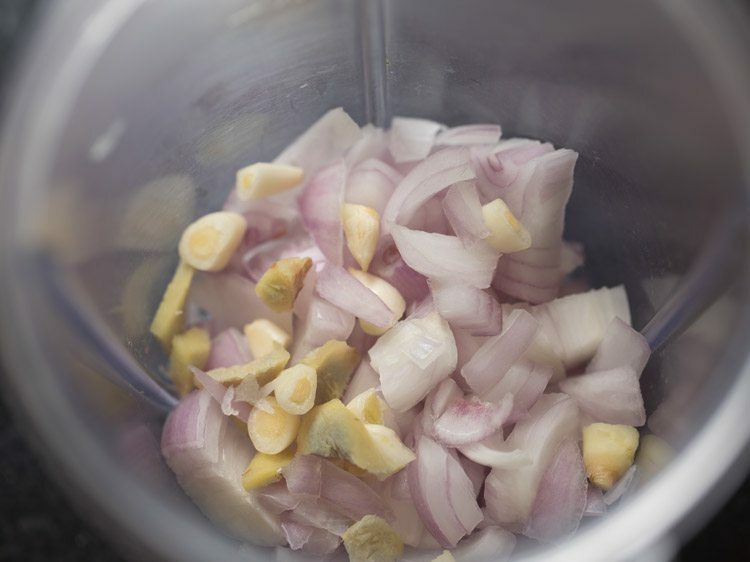 18. in a small grinder or blender jar, take ½ cup roughly chopped onion. also add ½ teaspoon chopped garlic and ½ teaspoon chopped ginger. 19. add 1 to 2 tablespoons water or add as required and grind to a fine paste. keep aside. 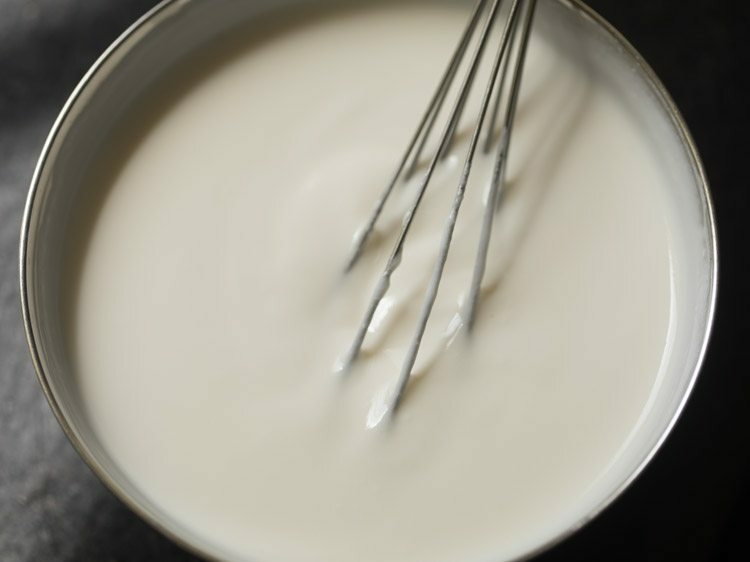 20. meanwhile whisk 1 cup of curd (240 to 250 grams) till smooth. keep aside. 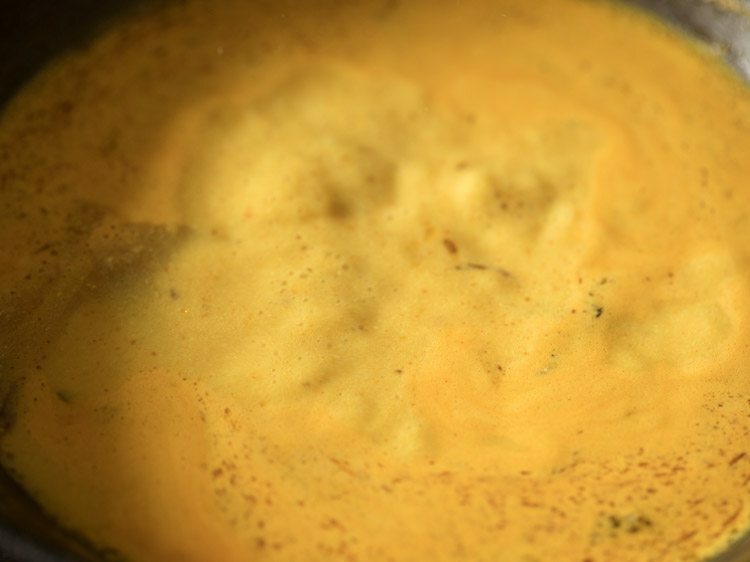 use full fat curd to make the sabji. 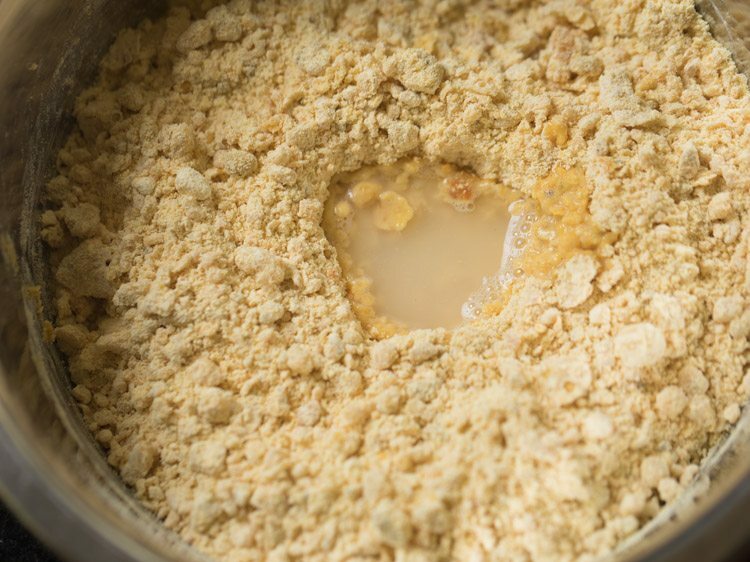 curd made from toned milk or skimmed milk will split. best is to use homemade curd which i always use in such recipes. 21. reserve 1 cup of the water in which the gatte were cooked. keep aside. 22. cut the cooked gatte in small thick discs. 23. these gatte are soft and you can see the texture from this picture. 24. heat 2 tablespoons oil or ghee in another pan. keep flame to a low or medium-low. 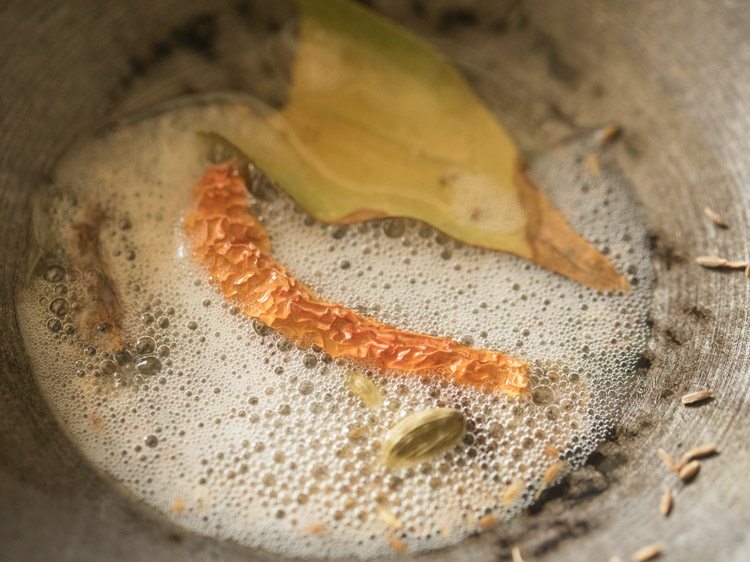 add 1 teaspoon cumin seeds, 3 cloves, 1 inch cinnamon, 2 green cardamoms, 1 small to medium tej patta and 1 dry red chilli (seeds removed). add all the spices together. so keep them ready before you heat the oil. fry till all the spices crackle. do not burn the spices, so fry them on a low flame. 25. now add the onion paste. take care as the onion paste splutters when you add it. 26. mix well and begin to sauté on a low to medium-low flame. 27. stirring often sauté the onion paste. 28. sauté till the paste turns golden. 29. now switch off the flame and add the whisked curd. you can also add the beaten curd in parts. 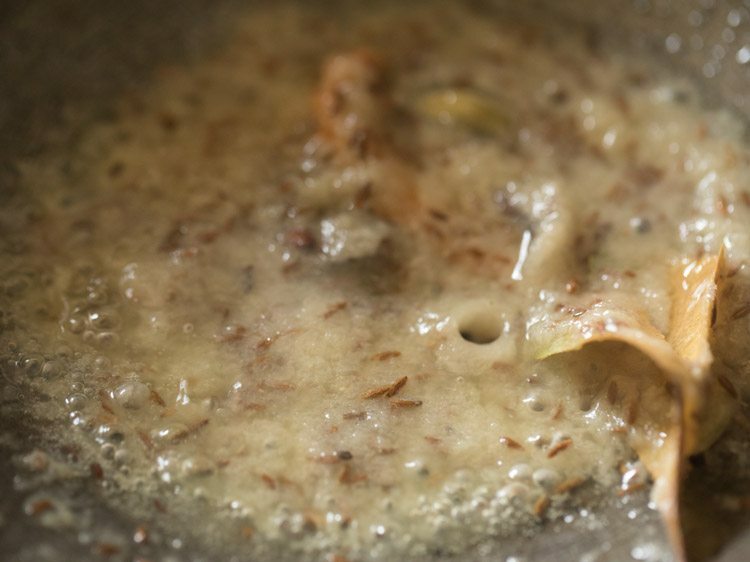 30. quickly mix the curd very well with the sautéed onion paste. mix very well. 31. now heat the pan on a low flame and keep on stirring continuously while the curd gets cooked. 32. let the curd come to a boil and you will see some oil specks on top. 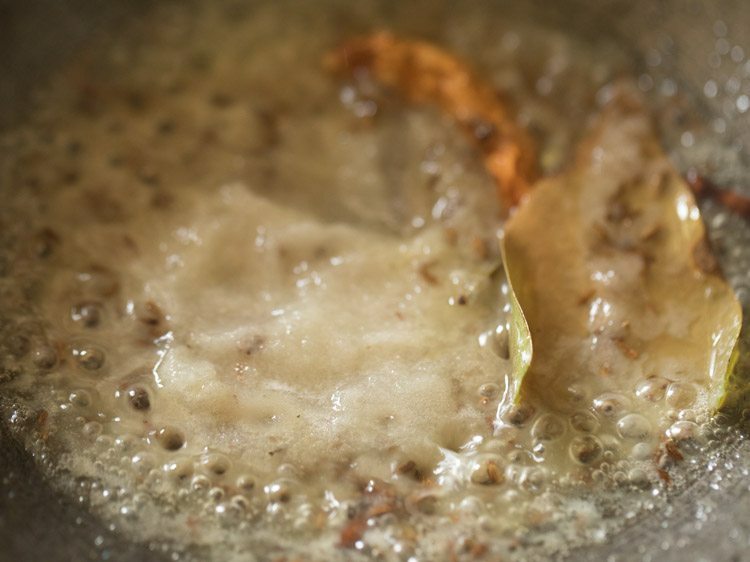 do stir continuously when the curd is getting cooked. 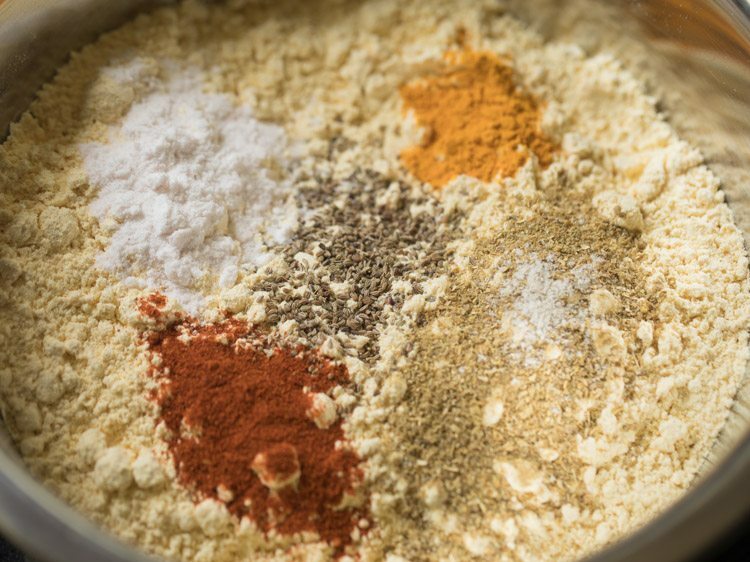 33. then add all the spice powders one by one – ½ teaspoon turmeric powder, 2 teaspoons red chilli powder, 1 tablespoon coriander powder and 1 pinch asafoetida (optional). 34. mix the spice powders very well with the curd. 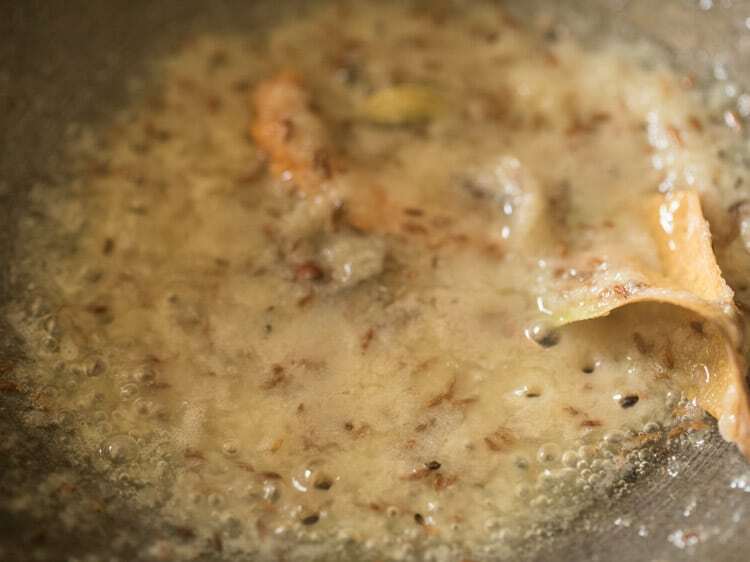 35. continue to sauté for 1 to 2 minutes till you see some oil floating on top. 36. now add 1 cup of reserved water in which the gatte were cooked. 38. add salt as per taste. mix again. 39. simmer the gravy or curry on a medium-low flame. stir at intervals. 40. let this gravy to a boil. 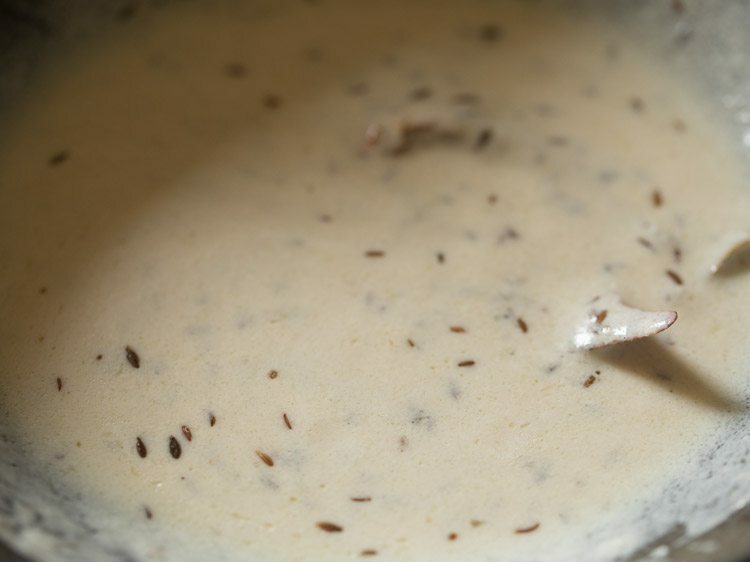 41. once the gravy comes to a boil, then add all of the gatte pieces. 42. stir gently and lightly. 43. simmer on low to medium-low flame till curry thickens slightly. overall cook the gatte ki sabji for about 5 to 6 minutes or till the gravy thickens slightly. do note that on cooling the gravy thickens more. 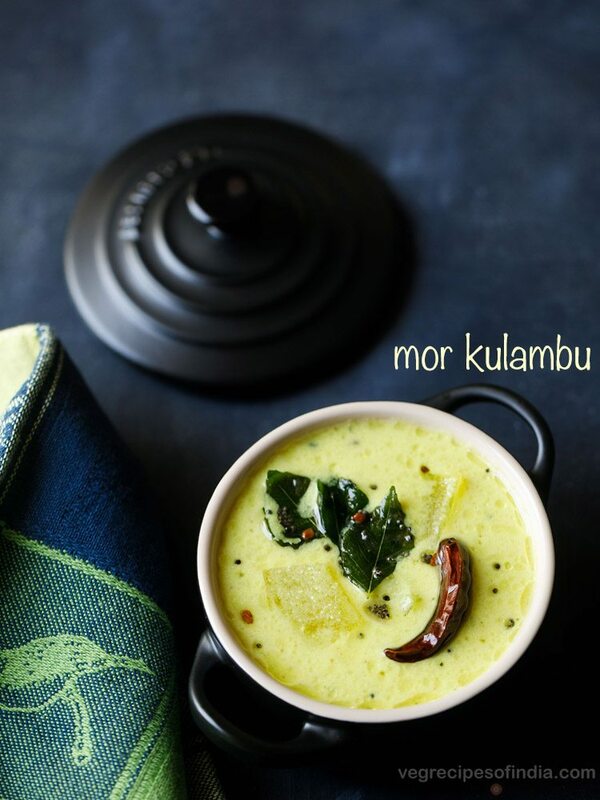 44. later switch off the flame and add 2 tablespoons chopped coriander leaves. 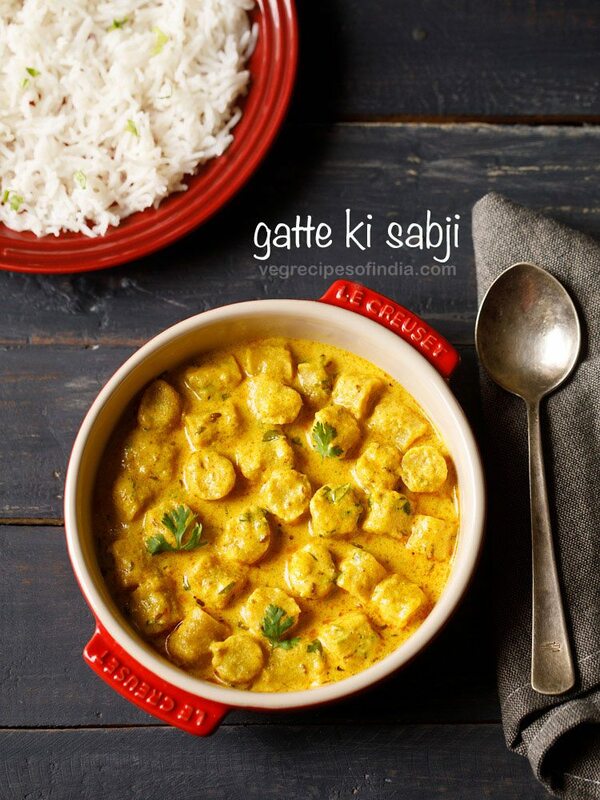 45. serve gatte ki sabji with roti or parathas or jowar roti or bajra roti. 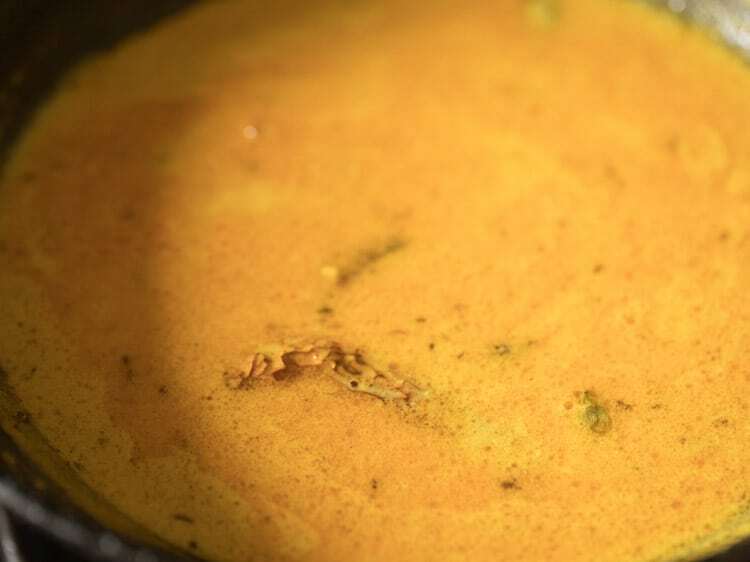 you can also serve this besan ki sabji with steamed rice or jeera rice.